Summer vacation for my family almost always included Oregon. My parents met and married while at Oregon State, and their immediate families still lived there. My Mom’s parents – my grandparents – lived in McMinnville and my grandmother owned the Dairy Queen. The Dairy Queen was on a busy corner, a few blocks from the junior high and high school. It was o-l-d building. My Mom and uncle worked there when they were in high school and my grandmother started working there when they went off to college. It wasn’t long before she bought the Dairy Queen. This was the 1950s. Women didn’t own businesses, but my grandmother was very independent. Some accused her of being stubborn. She always corrected them by telling them she wasn’t stubborn; she was independent. She was both stubborn and independent and certainly wasn’t going to ask permission! She was an excellent role model! My grandfather, a retired Army colonel who taught school and coached, really had no choice other than to go along with my grandmother’s decision. Actually, it worked out rather well for him. After he retired from teaching, he went on to become the President of the Dairy Queen of the Pacific Northwest. I can’t remember which came first: the 26-foot deep sea fishing boat or the Depoe Bay Dairy Queen. Either way, my grandmother bought the Depoe Bay Dairy Queen and my grandfather berthed his boat in Depoe Bay harbor. He hired a skipper to run the boat and they had a nice little charter fishing business. More on that in the future. The Dairy Queen was a highlight for my sister, brother, and me. My grandmother would take us with her to work and put us to work. We picked up trash in the parking lot. There was no indoor dining area, only tables and umbrellas in the parking lot, which we kept clean. Grandma believed cleanliness was godliness and always kept the cleaning cloths soaking in a Clorox solution in a relish pan. To this day the smell of Clorox reminds me of the Dairy Queen. Remember, this was the olden days, so there was a lot more prep work than what there probably is today. We peeled and sliced potatoes by hand! Real potatoes. I think they came in 50-pound bags. All I know was that even my sister and I working together couldn’t lift a bag of potatoes. It was a blessed day when we found out Grandma bought a potato peeling machine. It was huge, way taller than us and looked like a cylinder robot. You’d load the machine up and somehow it peeled the potatoes. It didn’t cut the potatoes. We still had to do that. It was amazing how many pounds of potatoes were converted into French fries. My favorite food at the Dairy Queen was the Royal hamburger. It was a rectangular hamburger patty on a rectangular bun wrapped in a foil wrapper. No one else had anything like it … not that I would know … we didn’t eat out much. Of course, Dairy Queen was really known for its soft-serve ice cream with the curl on top. There really is an art to making that curl. Perfecting that curl was a rite of passage for us grandkids. The other special treat was counting the money at the end of the last shift. 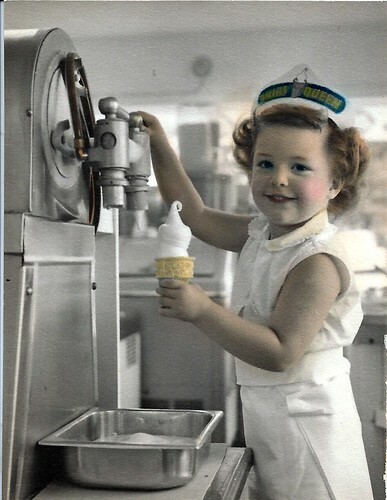 Grandma would go down to the Dairy Queen about 10:00 at night to pick up the money and make sure everything was cleaned up before locking up. She’d come home with the money in a special bag and set about getting the deposit ready. We’d sort all the money into their respective denominations and count it all out. The we’d roll all the coins. She’d reconcile it against receipts (I think that’s what she was doing) and get the deposit for the bank ready. Often, we’d go with her to the bank the next day. She knew everyone in town, and having us in tow was just an excuse to show off her grandkids! I was the oldest grandchild (I’d like to say favored grandchild, but we were all favored). My grandfather was an avid photographer (you can see where this is going). Needless to say, my grandfather never missed a photo op with his grandchildren! For years, the picture in this post was on the back wall, visible to everyone who came to the walk-up window. I was probably three years old. What I remember most about that picture was having to sleep in rag curls and tons of hair spray to get my hair to hold those curls! And the bobbie pins holding on that hat were stabbing me. I wish I had a picture of the Dairy Queen car! It was blue, painted with Dairy Queen stuff on the sides. It was probably from the 1940s, although I’m not sure. My grandmother drove that car everywhere. We loved riding in that car, although I’m certain there wasn’t anything safe about it. There were no seat belts and all three of us (my sister, brother, and myself) would squeeze into the front seat. But heck, we were on vacation! Awww What a cute little cherub you were! I think there is a picture of the Dairy Queen car in one of the photo albums at mom and dads. I believe there were two little movie stars in sunsuits and sunglasses along side it – and maybe our little bro too? The potato peeling machine reminded me of R2D2 and it was quite a saver of time and skin on the thumbs as I remember. Ah those were the days when a big ol ice cream cone was 25 cents and we would all be sticky messes by the time we were finished with them. Oh, you made me cry thinking of those days. Although I was young during the days you were working at the McMinville store (I was put in a box on top of the freezer for a few years) I do remember eating there a lot. The Depoe Bay store I did work at and have many fond memories of that. Grandma would sent us down the street to the bank with the deposits. I was only 8 or 10 then. I remember making Dilly Bars, Buster Bars cleaning, running the register, cutting up cardboard and what ever else needed to be done. Sleeping on a cot in a small room. Playing on the rocks under the bridge. Whale Cove was a treat and the Chinese Resturant up the road. Of course fishing on the GARJACK. Most of all I remenber Grandpa saying we were eating all of the profits!. Driving back to Mac in the 1969 Cougar with Grandma to Mac. after a few days (yikes) Grandma drove pretty fast with her big “Pepsi”. Sure miss those days. Previous PostPrevious The 21st Century. For Reals?